Blurb: The sort of album that slowly creeps into your head and doesn’t let go. Only the second full-length album from Uglyhead, The Garden has a surprisingly organic, living sound. 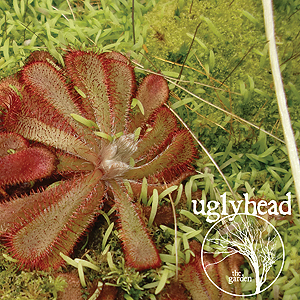 Perhaps best described as progressive industrial punk, Uglyhead manages a sound that is simultaneously blisteringly harsh and incredibly mellow, creating a striking balance between the two and easily flirting with both ends of the spectrum. Flushed with atypical song structures and endless surprises, the album is, in a word, riveting. From the opening of “The Path,” Uglyhead proves to be a strange beast as the subdued rhythm is belted out over extreme levels of distortion and noise creating an overtly ugly song that still manages to dazzle. The beginning of “Through the Gates” shows the other side of the coin as lovely synth work takes center stage, but as it transitions into an epic exploration of noise, the track does create the sensation of passing beyond the safety of isolation. “Nerium” proves to be one of the harshest songs of the album, but does it not with just heavy beats and liberal amounts of distortion, but by remaining unpredictable and employing a near perfect use of slower, nonchalant vocals that temper the chaos surrounding them, once again showing Uglyhead’s ability to deftly mix harsh and mellow with the ability to send pulses racing. Incorporating such elements as nu metal guitar in “Between the Leaves,” sounds of frogs and swarming insects in “Lichen,” heavy gabber styled beats and breaks in “Drosera,” violin in “Kudzu,” and dreamy shoegazer styled guitar in “Blight,” Uglyhead constantly impresses with its ability to experiment and seamlessly integrate these disparate elements while still maintaining a cohesive sound. Uglyhead is the sort of act that feels delightfully disheveled and revels in its rough edges to produce an in-your-face sound much like what grunge did with rock in the ’80s and ’90s. With The Garden a surprising feel of effortlessness pervades as the pieces of music that, at first glance, seem almost random flow into a magnificent larger picture that is not immediately apparent. Conquering a surprising range of moods and sounds, Uglyhead has produced an absolutely stunning and smart album that, though likely not for everyone’s tastes, brilliantly challenges both structure and genre in a way that should really be heard to be believed.